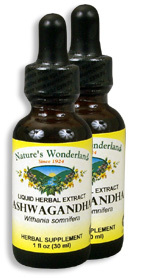 Ashwagandha Extract, 1 fl oz / 30 ml each (Nature's Wonderland) - Penn Herb Co. Ltd. If you're always on the go or find yourself putting out more than you put back in - restore and rejuvenate with Ashwagandha! The Ayurvedic tonic boosts stamina and helps the body adapt to physical & mental stress. Ashwagandha is described in ancient Ayurvedic medicinal texts as a “rasayna” or health-promoting tonic. The restorative root promotes youthful longevity, strengthens & balances body systems, and restores sexual energy. Get a caffeine-free boost to your day with our fast-acting extract! AMOUNT PER SERVING (667mg/ml or 30 drops): Certified Organic Fresh Ashwagandha Root (Withania somnifera). OTHER INGREDIENTS: Grain Alcohol (58-68% by volume), Deionized Water. Free of: milk, dairy, egg, fish, shellfish, tree nuts, peanuts, wheat, gluten or soy. Helps body adapt to physical & mental stress; promotes energy; restorative tonic; eases tension and stress; supports nervous system health; builds healthy blood; restores sexual energy; supports the immune system; supports thyroid health. 30-60 drops in water or juice, 2-3 times daily, or as needed. DO NOT TAKE DURING PREGNANCY. Shake well before using.